PENANG, Malaysia – The PAN Asia Pacific (PANAP) will join organizations of farmers, farmworkers, fisherfolk, indigenous peoples, rural women and youth across the Asia Pacific to declare 29 March as the “Day of the Landless” through coordinated actions. 29 March is a historic event in the people’s struggle for land and resources in the region. The Asian Peasant Coalition (APC) was founded on the said date 12 years ago to challenge imperialist and feudal oppression and exploitation. The declaration is being led by APC to commemorate its anniversary this year. 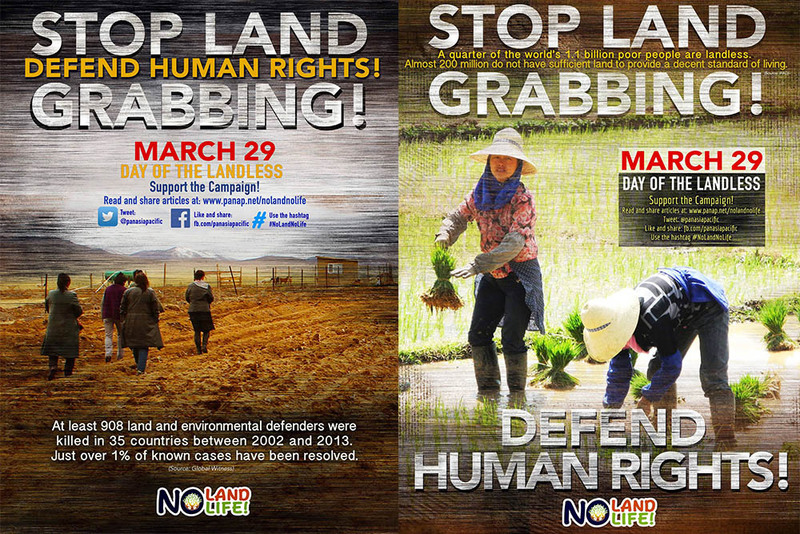 The declaration of the “Day of the Landless” will also mark the launching of the “No Land, No Life!” campaign, a regional initiative that aims to highlight land and resource grabbing as a human rights issue. “Through this campaign, we will collectively work to engage concerned officials and agencies at the local, regional and global levels to address the human rights violations arising from and related to land and resource grabbing,” said Sarojeni Rengam, PAN Asia Pacific (PANAP) Executive Director. About a quarter of the world’s 1.1 billion poor people are landless, according to the latest data from the International Fund for Agricultural Development (IFAD). Almost 200 million do not have enough land to provide a decent standard of living. Meanwhile, data compiled by Global Witness show that between 2002 and 2013, some 908 land and environmental activists were killed in 35 countries. Just over 1% of known cases have been resolved. The Peasant Movement of the Philippines (KMP), which together with the youth arm of the National Network of Agrarian Reform Advocates (NNARA Youth), will hold an education festival and seed distribution activities in a province near Manila, Philippines on 28 to 29 March. The Alliance of Agrarian Reform Movement (AGRA), which will organize a public educational activity and a protest rally in Jakarta, Indonesia on 28 March. The Sarawak Dayak Iban Association (SADIA), which will hold an indigenous ritual on “land cleansing” and a workshop on native customary rights and land struggle on 28 March in Kampung Sungai lingkau Simunjan, State of Sarawak in Malaysia. The National Fisheries Solidarity Movement (NAFSO), which will organize a public forum, art exhibit and cultural activities in Negombo, Sri Lanka on 28 March that would also highlight the role of women. Other groups that are expected to also organize activities as part of the “Day of the Landless” declaration are the Society for Rural Education and Development (SRED) and Tamil Nadu Women’s Forum (TNWF) in India; the Human Development Organization (HDO) in Sri Lanka; and the Pakistan Kissan Mazdoor Tehreek (PKMT) and Roots for Equity (ROE) in Pakistan.